The Service Desk is at the frontlines of a changing landscape in IT. IT is now, more than ever, required to provide 100% uptime of their services, and provide them to users anytime and anywhere – thanks in large part to the growth in new consumer apps and services accessed through mobile devices. •Mobile. More and more, users are accessing their services through their mobile devices. Powerful trends are shaping the mobile world that will impact the Service Desk. We in the service desk must adapt, but what does that mean? •Service Availability. Users expect their services to always be up – just like they experience with their other mobile apps and should there be an issue, they expect it to be resolved immediately. What can the Service Desk to make this dream a reality? •New Technologies. Prompted by this need for always-on, mobile-available services, infrastructure teams are looking toward newer technologies such as public clouds, software defined networking (SDN), and hyperconverged architectures. How does this impact the Service Desk? 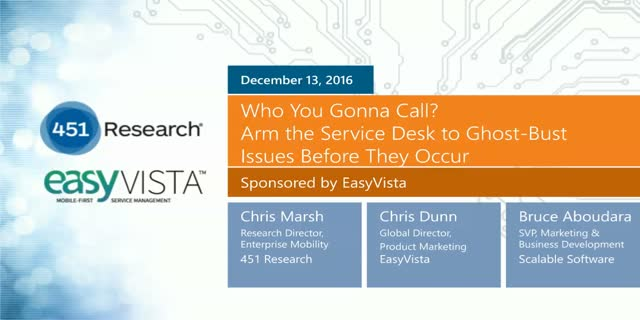 Join, Chris Marsh, lead mobility analyst at 451 research, Chris Dunn, Global Director of Product marketing for EasyVista, and Bruce Aboudara SVP at Scalable Software as they discuss the key trends the service desk need to know about as well as actions the service desk can take to capitalize on those trends.